Students will be able to use a compass rose to identify cardinal directions. Ask a student to stand in front of your desk. Have another student direct the student by your desk toward the classroom door. Ask the rest of the class which direction the student is facing by the door. Tell students that today they will learn a different way of telling someone which way to go in the classroom. 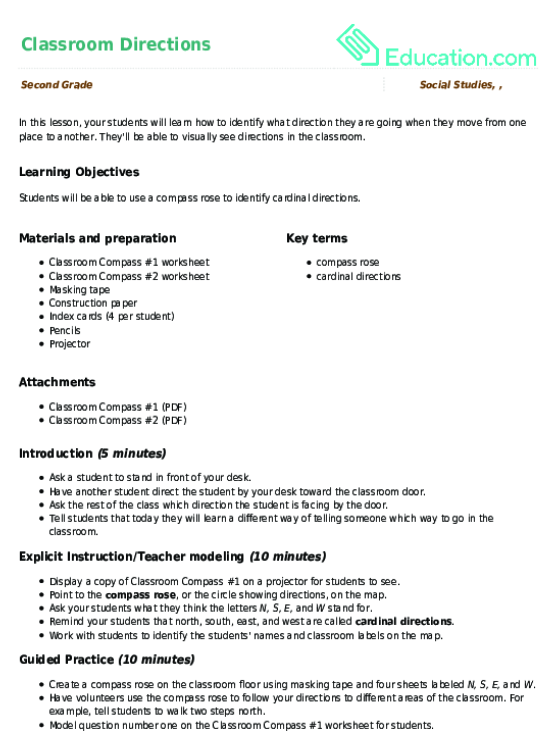 Display a copy of Classroom Compass #1 on a projector for students to see. Point to the compass rose, or the circle showing directions, on the map. Ask your students what they think the letters N, S, E, and W stand for. Remind your students that north, south, east, and west are called cardinal directions. Work with students to identify the students' names and classroom labels on the map. Create a compass rose on the classroom floor using masking tape and four sheets labeled N, S, E, and W.
Have volunteers use the compass rose to follow your directions to different areas of the classroom. For example, tell students to walk two steps north. Model question number one on the Classroom Compass #1 worksheet for students. Complete questions two through five with your students. Read aloud the directions on the Classroom Compass #2 worksheet. 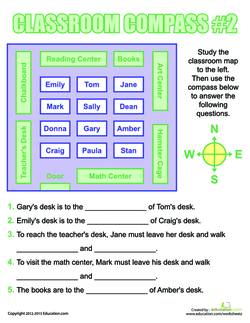 Have students complete the questions about the map on their own. Enrichment: Have your students combine the cardinal directions to make northwest, southeast, etc. Invite them to direct you around the room using these words. Support: Have your students create their own compass roses, and instruct them to cut them out and use them during the assessment. Have students label four index cards N, S, E, and W.
Point to identify which side of your classroom is the north side. Explain that even though the N on the compass rose faces up, north is not always the direction right in front of them. Walk in different directions around the classroom. Have students hold up the correct index card to show which direction you're moving. Ask students to explain how knowing how to read the directions north, south, east, and west on a map can be helpful to people. Introduce your beginning geography student to the cardinal directions: north, south, east and west! Get your kid familiar with cardinal directions: north, east, south, and west. 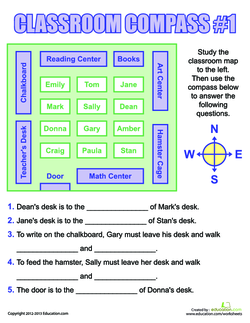 This worksheet lets your child practice with directions in a familiar setting. Give him a fun activity where he'll practice following directions in order to solve a riddle. Class is in session, and it's time for your second grader to learn her directions! She'll practice following directions: north, south, east, and west.